The Interior Department’s reassignment of a large swath of its top career employees sparked confusion and pushback, recently released internal emails show, prompting some executives to quit and others to question the wisdom of the forced transfers. The decision to require roughly three-dozen Senior Executive Service employees to take on new roles “as a condition of employment” was met with criticism since the reassignments came to light in July, but Interior has defended them as in the business interest of the department. Some of the transfers were justified because Secretary Ryan Zinke wanted to move more jobs out of headquarters offices in Washington, D.C., and Denver, the emails recently released through a Freedom of Information Act request show, though more than half of them pushed or kept the employees in the capital region. In some cases, Daniel Jorjani, Zinke’s choice for principal deputy solicitor, directed human resources staff to make organizational changes by taking “whatever administrative actions that are required.” The specifics of those changes were redacted in the released emails. Employees who were reassigned, as well as those awaiting them at their new posts, often expressed surprise and confusion in their communications with HR staff regarding the changes. One SESer responded to his reassignment notice with follow up questions, and went days without getting a response. “I was beginning to worry that maybe I had just dreamed that I had pushed the send key,” the executive said when he finally received a response from Mary Pletcher, Interior’s deputy assistant secretary for human capital and diversity. Another reassigned supervisor expressed confusion over basic details of her new job. “You stated the effective date to ‘show up’ at the [Bureau of Land Management] is July 10, 2017, but I still do not know the exact location I am to show up to or who to report to or at what time, etc.,” the executive said to Pletcher. Bruce Loudermilk was reassigned just eight months after he moved with his family from Alaska to Washington, D.C., to take the job as BIA director. His proposed new job was in the Office of Special Trustee for American Indians (OST), an office in which he had previously worked. Loudermilk ultimately negotiated to take a nine-month assignment at OST in Albuquerque, N.M. Three SESers retired in lieu of taking the “directed” reassignment, while another accepted a “voluntary downgrade” to a General Schedule-15 position. Interior opted not to follow through with several reassignments after initially sending notices. “I am just feeling like I am in a bit of a vacuum on this one without anyone who can give me any idea where we are in the process,” Thompson said. The emails were released after one of the reassigned executives, Joel Clement, issued a FOIA request. Interior initially declined to release the emails, but Clement sued and was successful. The former Interior employee rose to prominence after speaking out against the reassignments, saying they were politically motivated. He has since resigned from federal service. “The story that it told was just how sloppy the whole process was,” Clement said of the documents. He added that Interior officials had identified executives to transfer and subsequently worked backward to find a business reason to justify those decisions. Clement also won the release of emails related to the department’s policies on climate change. Political appointees frequently engaged with a career worker named Indur Goklany, an outspoken climate change denier and former employee of Clement’s in the Office of Policy Analysis. Goklany shared papers he had published in the Heartland Institute, such as “Carbon Dioxide: The Good News,” with top political appointees. 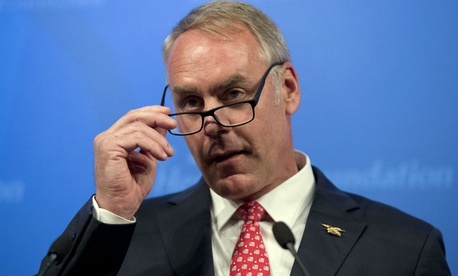 At the direction of political leadership, the emails show, he helped identify public-facing references to climate change on Interior’s website and suggested alterations to them and to the department’s mission statement.